From our farm to your table. 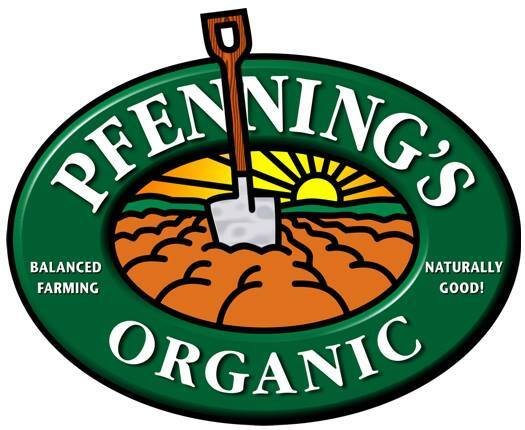 Pfenning’s Organic Farm is a Farmer, Packer & Distributor of organic produce. To us, Organic isn’t just a certification – it’s a way of being. A mindset. And a mission. Pfenning’s Organic Farm grows organic vegetables, grains, and legumes on their farms near New Hamburg, Ontario. They’ve been working in a close relationship with the soil and the life growing in and around their farm for over 3o years. The Pfenning family has been farming since the late 1600’s, or as far back as documented family history exists. Back then, everyone farmed organically. As chemicals were introduced into agriculture, at the turn of the century, Adam Pfenning and then his son Wilhelm Pfenning embraced the modern farming techniques and enjoyed the short-term yield increases they offered. However, by 1950 Wilhelm was starting to realize that he was sacrificing his own health because of all the agri-chemicals he was using and he started to question the nutritional value of the crops he was growing. In 1952 he made his first attempt at ‘chemical free farming’ but due to community pressure and lack of expert advice he reverted to ‘modern agriculture’ for a short time. His health continued to get worse, mainly from exposure to mercury-based seed treatments, but his love for farming did not diminish. After a lot of reading and asking many questions, Wilhelm started developing contacts with like-minded farmers. He found the writings by Rudolph Steiner to be a great inspiration and encouragement in his quest to produce wholesome food without destroying the environment and his own health. Finally, in 1965, with two young children and another on the way, Wilhelm and Barnhild decided to give organic farming another try; and they haven’t looked back. It was very difficult to farm differently from the neighbours in Gnodstadt, the small Bavarian village where the Pfenning family had lived for hundreds of years. The pressure from both neighbours and family was intense at first, but the last 37 years of farming have proved him right. Today there are several farmers in Gnodstadt who have converted to Organic farming. In 1968, the local bakery reluctantly gave in to Wilhelm’s insistence and started stone milling fresh flour from organic grains. Today it has a thriving business baking organic sourdough bread, while most small rural bakeries have gone out of business. In spite of a lengthy battle with the West German Autobahn Commission, the Farmstead that had been built by Wilhelm became part of the planned roadway of the new A7 Autobahn 1n 1978. Wilhelm and Barnhild decided to look to the future and moved themselves and all four children (ages 11 to 19) to Canada in the fall of 1981. The family immediately started farming on the land where we are located to this day. Today, the farm is operated by Wolfgang and Ekkehard. Even though Wilhelm passed away in 2011, his wisdom and experience act as a guide and measure for the daily decisions that are necessary in running a farm. With hard work and some luck, the next generation of Pfennings will be ready and able to join the family business in 5 to 10 years. They sell their products wholesale to retail stores, restaurants, caterers and food processors. You can find their organic food at a retailer near you. Or order from the farm and have it deleivered to your home.